I just love teaching the children the truth about dinosaurs — that they were made on the sixth day of creation alongside Adam and Eve. I love to teach them how to think correctly about origins based on Job 38:4. I.e., when someone says “millions of years,” these children will now know to ask politely, “Were you there?” Oh, the secularists hate me teaching children the correct way of thinking. They go ballistic, knowing kids are being taught think in the right way concerning the truth about origins. 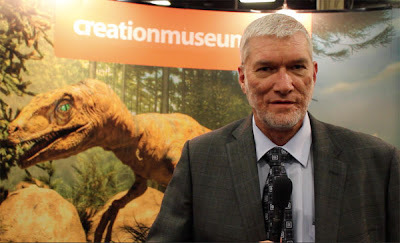 I made sure all these young people understand that God created the universe in six literal days about six thousand years ago and that most of the fossils came from the Flood about 4,300 years ago. Yes, thousands upon thousands of children are learning the truth, and we are making sure that we can reach as many children and young people as we can, including at our Creation Museum. Bill Nye, who is really the “Humanist guy,” is out to get kids and brainwash them into secularism and atheism. We need to do all we can to capture these kids for the Lord Jesus Christ.